Shinzo Abe stated that Russia and Japan should 'build a strong cornerstone of stability in Northeast Asia'. 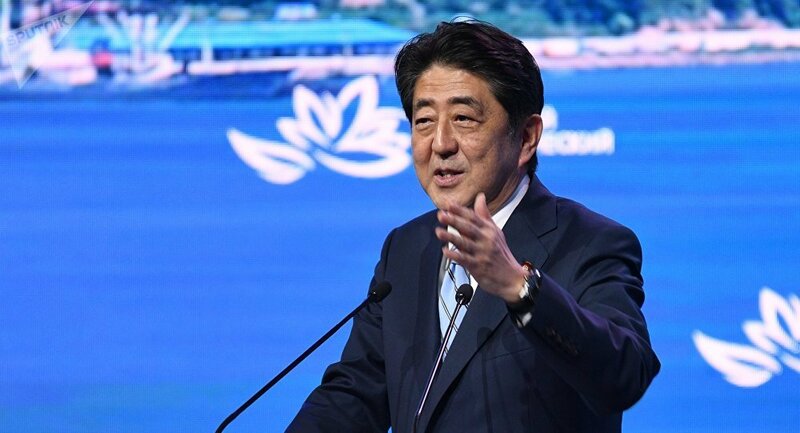 MOSCOW (Sputnik) — Russia and Japan should further strengthen their relations and carve out a new era for bilateral relations, Japanese Prime Minister Shinzo Abe said Thursday on the sidelines of the Eastern Economic Forum (EEF). "Japan and Russia must deepen their trust even further and strengthen their relations in terms of both the economy and security, building a strong cornerstone of stability in Northeast Asia… Why do not we, Japanese and Russians, join hands and carve out a new era in Japan-Russia relations?" Abe said. "To build mutual trust, it is best to work together and share success with each other. We have chosen mutually beneficial areas and projects that will bring mutual benefit," Abe said. Japanese Prime Minister Shinzo Abe also said he considered the situation in which Moscow and Tokyo do not have a peace treaty to be abnormal, and calls on Russian President Vladimir Putin to correct this. "In just one year, many things began to move between Japan and Russia that we had been unable to do during the last 70 years. And if we continue the steps for another year and then another year, then we will see the bright future of Japanese-Russian relations that have fully revealed the potential. For this, we must put an end to such an abnormal situation when we still do not have a peace treaty," Abe said at the Eastern Economic Forum. The two-day EEF kicked off Wednesday, which drew over 3,500 participants from more than 50 countries. Several world leaders are attending, including Putin, Moon and Abe. Rossiya Segodnya International Information Agency is a general media partner of the forum.